When you find that your oven temperature isn’t accurate, it can throw off your whole day. You may notice that your dish comes out undercooked or overcooked. Our troubleshooting guide includes the top 5 reasons your oven temperature is inaccurate. What it is: One of the most common reasons for an oven temperature not accurate issue is a burned out bake element. When operating properly, the bake element will glow red hot. If you notice that it is not glowing red, then it isn’t heating as it should. How it fails: You can often see visible damage on a heating element that’s burned out. Holes or blisters will form on the bake element, causing it to malfunction. How to diagnose it: You can also use a multimeter to determine if the bake element is burned out or defective. If there is no continuity, or you see visible damage, it will need to be replaced. What it is: A convection element works with other heating elements to heat the air inside your oven. However, if it is burned out, it cannot heat properly. How it fails: If your convection oven temperature isn’t accurate, it may be due to a burned out convection element. How to diagnose it: Use a multimeter to determine if the convection element has continuity. If not, it will need to be replaced. What it is: An oven temperature sensor, along with the oven control board, regulates the temperature. It varies its resistance to electrical current when working properly. As the oven temperature increases, the temperature sensor creates greater resistance. How it fails: If it gives the wrong amount of resistance, your oven will not have an accurate temperature. How to diagnose it: Some temperature sensors can be recalibrated. Find this information in your owner’s manual. If your model cannot be recalibrated, call a professional oven repair technician. What it is: As mentioned above, the oven control board works with the temperature sensor for regulation. It also varies its resistance to electrical current as temperatures increase or decrease. How it fails: If defective, the oven temperature will not be accurate. How to diagnose it: Some oven models allow for control board recalibration up to 35 degrees Fahrenheit higher or lower. Check your owner’s manual for model-specific instructions. What it is: When the oven temperature gets too low, the temperature control thermostat cycles the heat on. How it fails: Sometimes, this thermostat is not calibrated correctly, causing it not to cycle the heat on when needed. This then causes to an oven temperature not accurate problem. 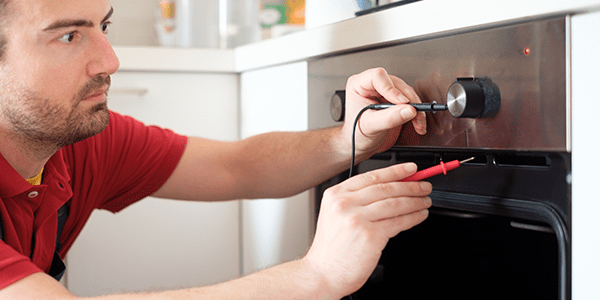 How to diagnose it: We highly recommend hiring a professional appliance repair company to diagnose and fix your oven’s temperature control thermostat is you suspect this is the issue, as they are complex parts. Learn more about the most common oven and range problems, or call ABC Appliance Repair Hartford for professional help.